Weather and climate can often affect how much you enjoy your vacation and what activities are feasible during your travels. In Vietnam especially, this is a huge consideration. 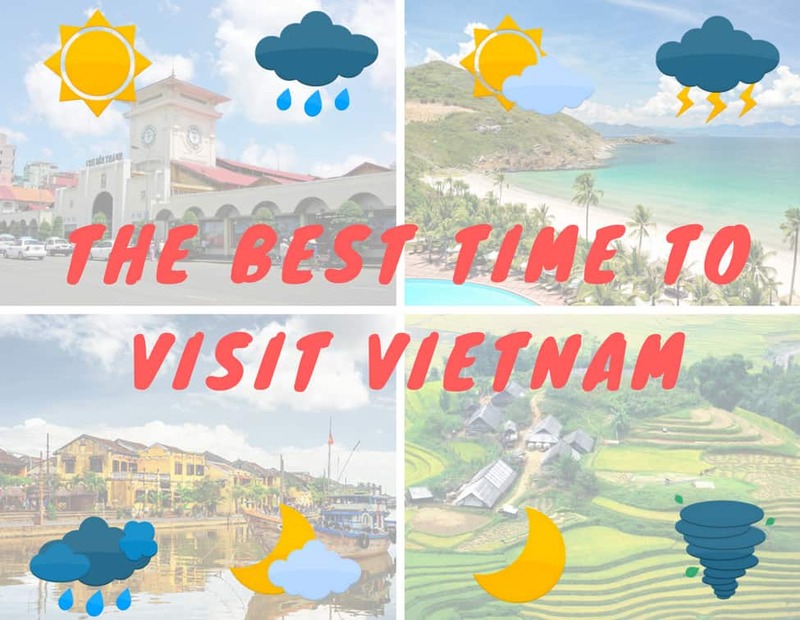 With more than 2000 miles between the Northern and Southern tips of the country, the weather in Vietnam in incredibly varied. Fortunately, regardless of when you visit the country, you can maximize your time in good weather. Use these Vietnam travel tips to decide the best time to visit Vietnam. 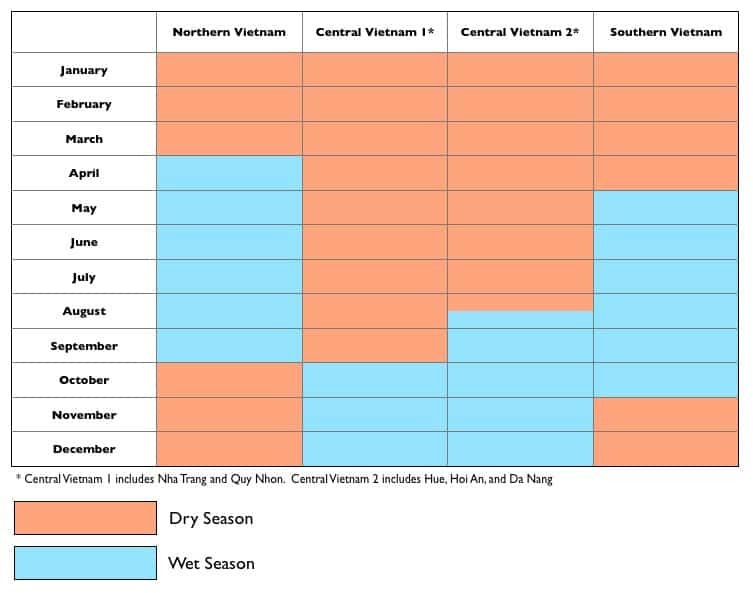 A simple chart showing the dry and wet seasons of Northern, Central, and Southern Vietnam. The mountainous regions of the north are characterized by wet and hot summers and dry and cold winters. The dry season lasts from October to the end of March (average 20C, although in the far north the average is much lower) and the wet season from April to September (average 28C). Come prepared for chilly weather in December and January – you may even see snow in the far mountainous North! Although the temperature drops in the dry season, it is much more pleasant to visit Northern Vietnam during this time. Halong Bay: Cruises in Halong Bay are astonishing. But wet season marks for occasional storms in the Bay so cruises are frequently cancelled or cut short when there is a storm warning. Sapa: Sapa can be scenic in both wet season and dry season. Early spring (April) is when many of the flowers are blooming so the scenery can be very colourful and lively. However, the rice fields around Sapa only have one harvest a year so if you want to see the lush green rice terraces, you have to visit around October. Central Vietnam is more varied in temperature from city to city. Nha Trang and Quy Nhon are more south so they have a much longer dry season from January to September (average 28C). In contrast, Hue, Da Nang and Hoi An have a dry season from January to August at best (average 25C). Hue’s weather is known to be notoriously bad in that it stays gloomy and drizzly for the greater part of the year due to its unique location within a mountain range. Just on the other side of the mountain range, Hoi An and Da Nang tend to stay hotter and drier. Keep in mind that the wet season in this part of Vietnam often brings typhoons and nasty rain storms. Nha Trang and Quy Nhon – Early September is an ideal time to visit this part of central Vietnam – the weather is still nice enough to enjoy the pristine beaches with little rain and the cities are not riddled with tourists, as peak tourism season in this area is from June-August. However, the beaches are at their best and most beautiful in April! Hue – The Phong Nha caves near Hue are a popular tourist destination and a must see if you will be traveling in this area. One of the most unique experiences here is to be able to swim in the river that runs through the caves but this is only possible in the dry months. During the wet season, the water level is too high and there is too much sediment in the water to permit swimming. The cities in the south also vary considerably weather wise but the climate here is more temperate than Northern and Central Vietnam (25C -35C year round). The wet season lasts from May to November and the remainder of the year stays mostly dry. Although the temperature remains nearly the same, the humidity varies a lot throughout the year. Be prepared for peak humidity between February and May. Fortunately, during the wet season, you can expect heavy rainfall usually only once a day for a short period of time. Farther south, Phu Quoc gets more rainfall than other parts of South Vietnam and the waters are less blue and more choppy during wet season, although Phu Quoc is highly visited year round. Da Lat is quite different than other places in the South because the city is perched in the highlands. It can be cold in the winter, around December and January (average 20C), and really wet and humid from June to October. Phu Quoc: the island is still developing so many of the roads are not fully built. If you want to make your way to the other beaches on the island during the wet season, be prepared for a very muddy trip! Da Lat: Da Lat is known for outdoor adventure sports like canyoneering and whitewater rafting but many outfitters will cancel excursions in the wet season if the water levels are too high or if the current is too strong. We wish you dry weather and sunny skies during your time to Vietnam and remember to pack appropriately for your trip. Have questions for us about our Vietnam tours? Check out our FAQ page and see if other customers have had similar inquiries. I am interested in Nha Trang and Quy Nhon I was stationed Phi Hiep would like more information.